Water can damage your home in many ways. Most of the time it's an external threat, but sometimes a leak from inside can cause just as much, or even more, damage. For example, a leak in the water heater in the Union County, Pa., Government Center unleashed 2,000 gallons of water in early July; this affected about 12,000 square feet of the building, and the estimated repair cost totaled $100,000. Must have been a massive water heater, right? Not really. All of the damage was caused by a leak in a 30-gallon water heater, smaller than many of the ones found in residences. When a leak develops, the water might not come rushing out at once. Most of the time it's a slow leak that may go unnoticed for days. If the water heater is located on an upper floor, the damage will be even more extensive, since water always flows downhill. In the case of the government center building, the leaking water heater on the second floor caused extensive damage to both walls and flooring as the water sought the lowest spot in the building. It's a good idea to flush the water heater tank twice a year to eliminate sediment buildup. Putting in an inexpensive drip pan below the water heater that drains to the outside of the property can help prevent thousands of dollars in water damage in many cases. Age is also a big factor. Many water heater manufacturers estimate the lifespan of these appliances to be 8 to 12 years, so replacing a unit when it is nearing this age can be good insurance policy against unwanted damage. 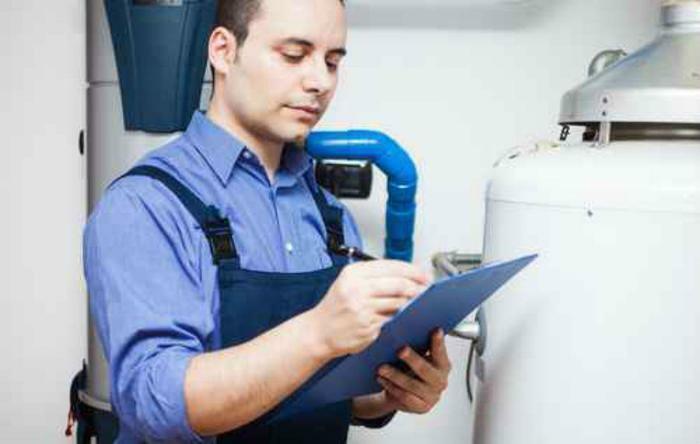 Unfortunately, leaking water heaters result in countless insurance claims each year. If a small leak goes unnoticed – occurring while you are on vacation, for example – the damage can quickly escalate into a major claim. Industry studies consistently show that water damage from washing machines and water heaters are the leading sources of water damage claims. To avoid problems, the adjusters at American Family Insurance offer some tips that will help you recognize when your water heater is about to fail. Water doesn't get as hot as it used to. There's rust in water coming from your faucets or on your clothes. Your hot water heater makes cracking and popping sounds when it's heating. There's a metallic taste in your hot water. Rust is forming on the outside bottom of your water heater. A puddle is forming under your hot water heater. The burner units have become clogged or rusty. If you notice any of these signs, call a plumber or water heater specialist.